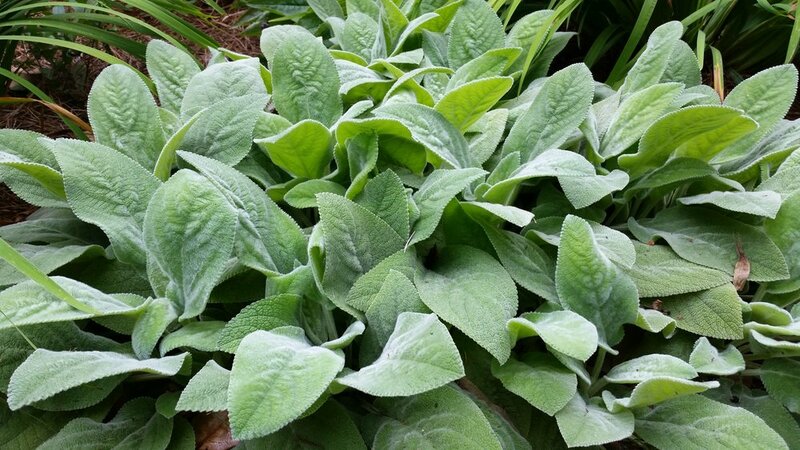 One of my favorite plants for edging is Lamb’s Ears, Stachys byzantia ‘Helen von Stein.’ Like other plants with fuzzy gray leaves, it is heat and drought tolerant. I use clumps of it along the edge of a driveway, where summer heat makes the asphalt as hot as molten lava. It looks good winter and summer – until suddenly it doesn’t. The lower leaves turn yellow, then gray, and shrivel. Grab your pruners and show a little tough love! Here is a photo of Lamb’s Ears that need renovating. From a distance, the plant appears fine, but a closer look will reveal dead leaves at the base. There are three methods of bringing them back to beauty. First, you can use a leaf rake and just rake the heck out of them. This will remove all the tattered leaves, but also damages the attractive new growth. Second, you can run over them with a bagging lawnmower set at the highest setting. The third method is my favorite. I use a pair of hand pruners to remove all the older leaves, the good ones as well as the ragged ones. Here is a photo of the trimmed plant. It looks pretty radical, but a sprinkle of liquid fertilizer will cause a quick regeneration. Here is the same plant, nine weeks after the scalping. Rejuvenated plant is beautiful again! Children love touching the felt-like leaves of Lamb’s Ears. The gray-green color looks good with almost any other color except chartreuse or yellow (my opinion only – yours may be different). They are especially attractive when paired with pink, rose, or hot shades of red and orange. Use them to create peace between flower colors that might clash. Between red and purple, for instance. Mature Lamb’s Ears will throw lilac flowers. I remove the bloom stems since I think they detract from the velvety leaves. Skip overhead watering or excess irrigation to avoid leaf and stem rot. Do not use heavy mulch near the plant’s base. I have never experienced insect issues with those in the Mary Snoddy garden, but the large leaves do provide a nice shady spot for snails to siesta during the daytime.